Put shrimp in a large resealable plastic bag. 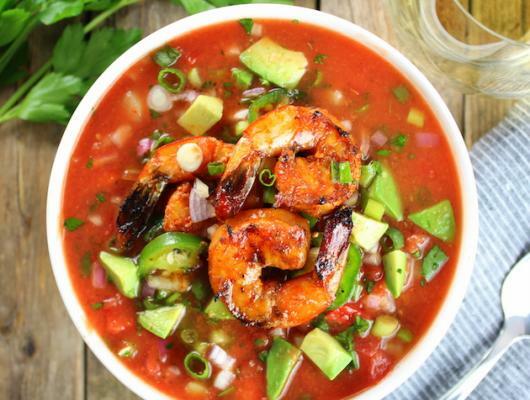 Mix the remaining ingredients together and pour over shrimp. Marinate 20 minutes in the refrigerator. Heat grill to 450-500 degrees and grill for 2-3 minutes per side. Wash, dry and remove the core of each tomato. Over a fine mesh colander with a large bowl underneath, use a spoon and scoop out the meat of the tomato, leaving the skin and flesh intact. Make sure all the juice, seeds and meat go into the colander. Set the hollowed out tomato aside. Make sure the tomato seeds are removed from the meat, then put the tomato pieces into a food processor (or blender). Using a spatula press, stir, and work to get all the juice through the colander, leaving the seeds behind. Discard the seeds and add the juice (should be about 11/2 cups) to the food processor. Add half of one chopped red pepper, half of one chopped shallot, 2 minced garlic cloves, and 2 tablespoons of extra virgin olive oil to the food processor. Blend until completely smooth. Pour this liquid into a large bowl and set aside (should be 5 cups of liquid total). Finely chop the rest of the shallots and red pepper, jalapeno, cucumber, and tomato skin with flesh. Add to the bowl of tomato liquid, then stir in sherry vinegar, salt and pepper. Place in the fridge and let chill at least 2 hours (longer would be better) before eating. Meanwhile, finely chop the jalapeno, green onions, and parsley for garnish and refrigerate until soup is ready to serve. Slice and dice the avocado for garnish right before serving. Recipe Notes: You can also sauté the shrimp on the stove for 2-3 minutes per side if preferred. 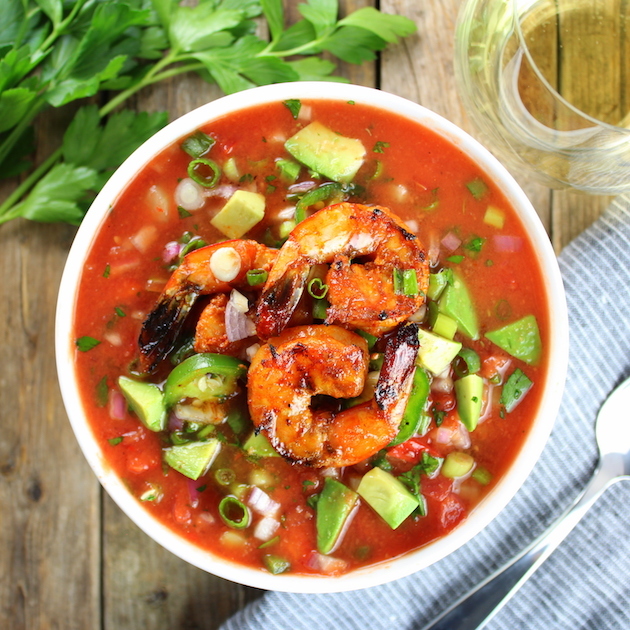 Classic Gazpacho with Spicy Grilled Shrimp - a perfectly healthy and delicious end-of-summer meal! Loaded with jalapenos, cucumbers, red peppers, shallots, tomatoes, olive oil and sherry vinegar. Low-carb, gluten-free, dairy-free, and Paleo friendly!